GUWAHATI,Jan 13:The elite Tani student organisation Takam Mising Porin Kébang(TMPK) and Mising Dírbí Kébang(Mising Cultural Association) have taken serious reservation on a dialogue in an Assamese film for its derogatory and utter negligent comment on Mising Tanis.The Mising organisations expressed strong resentment against the NK Productions recent Assamese VCD '' Bohagor Nachoni 2 " for the irresponsible and ill-motivated attitude towards the Mising Tanis. The TMPK units of Dhakuakhana and Lakhimpur on January 12 burnt several sets of the Assamese VCD in protest against the derogatory remarks.TMPK central committee's publicity secretary Dilip Pegu told that the organisation will not resist such filthy attitudes and insult of the community and condemned the NK Productions for its shortsigtedness. 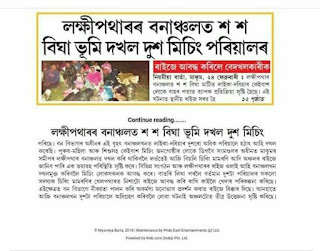 "The Mising tribe being the second largest community amongst tribals residing in the state of Assam will not remained silent on the issue that hurt the sentiments of the people emotionally and ethnically.It is the result of some ill-minded Assamese who bears negligent attitudes to its own sons of soils residing in the state in the name of promoting and diseminating Bihu culture,"he said . TMPK Lakhimpur district committee President Biju Pegu and General Secretary Kiran Chandra Doley informed that the VCD has been strictly restricted from selling in all Mising inhabited districts of Assam.It needs to mentioned here that Mising Tani inhabits in eight upper Assam districts of the state with a population nearing 10 lakhs. Meanwhile,the TMPK President Hemeswar Pegu told media persons that the NK Production should begged pardon from the Mising community publicly and warned of serious consequences if such incident are repeated in the future.He also questioned on who gave the firm the right to insult the community.In areas Dhakuakhana,Jonai,Dhemaji,Silapathar,Majuli,Dergaon,Golaghat,Sivasagar,Jorhat,Dibrugarh the student organization burnt many VCD sets.In Dergaon,the TMPK unit under Anjana Doley marched out a protest rally against the derogatory remark in the film.The TMPK and MDK has demanded the government to take the matter seriously and imposed ban on the film,otherwise it will approached the law courts to seek justice.The NK Production is a firm that make largest number of Assamese VCDs and cassettes.In one of the scene in the latest released " Bohagor Nachoni 2" has the dialogue "Tiri Miri Bathou Kuwa,Ei Chari Jator Ashoi Nupuwa" meaning stay away from Miri i.e.Mising. its really sad.....irresponsible activities by NK Productions..
@noni I have visited your blog before also and found quite impressive..pliz keep on updating. @pranab The TMPK is doing something unthinkable job,it is an awakening.. This production units are actually uncultured and insensitive. But we have to be careful, this dispute may help in thier publicity. low cost. Our web designing services are unique in the sense that our charges are very low while we provide high quality services.